Is a unique 2 bedroom bungalow villa, ( can sleep up to 6 persons ) very luxurious detached villa with big private pool, landscaped garden and private parking, located at Pissouri Bay. May be the most luxurious 3 bedroom Villa in Pissouri Bay. Stunning newly built detached offering comfort and relaxation with Private Swimming Pool & landscaped gardens. Large Villa with private pool and private big garden in Pissouri , with uninterrupted sea view. Luxury 3 bedroom villa with private pool landscaped garden. Free Wi-Fi. 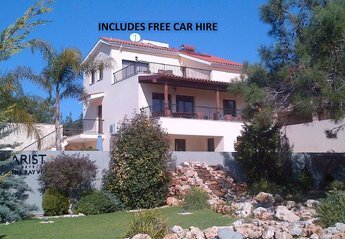 1 Bedroom Apartments - 100 Metres from Pissouri Beach - Air Conditioning - Communal Pool - Pool Bar - Outstanding Sea Views. These apartments are just a stones throw from a beautiful blue flag beach. 2 Bedroom Apartment - 100 Metres from Pissouri Beach - Air Conditioning - Communal Pool - Pool Bar - Outstanding Sea Views. These apartments are just a stones throw from a beautiful blue flag beach. Fantastic panoramic sea view . Three bedroom villa with private pool . Free Wi-Fi. The perfect place for a relaxing seaside holiday escape in sunny Cyprus. Close to the resort centre, amenities, and beach. Attractive and secluded gardens with areas of sun and shade to suit all.